Lizards are Reptiles. There are nearly 3800 different types of lizard in the world. Since they are cold blooded creatures, you can find them in all continents especially in the warmer climate continents except in Antarctica and most oceanic islands. Lizards have scaly skin that is shed throughout the year. They do not shed their skin in one go like the snake. Some lizards eat only meat, others eat only plants and still others eat both meat and plants. They have limbs and external ears but snakes do not have limbs and external ears. Most lizards will detach their tails when they are caught, so the lizard escapes while the predator only gets a tail to eat. They communicate with each other using body language or bright colours on their bodies. Lizard come in different sizes. 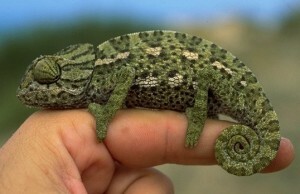 The smallest one is only a few centimetres (a couple of inches), such as chameleons or geckos. The longest grow to nearly 3 metres (10 feet)! The largest living lizard is the meat eating Komodo Dragon. There are some even huger extinct lizards, such as the sea-dwelling Tylosaurus which was about 17 metres (56 feet) long and the Megalania, a giant monitor lizard about 7 metres (23 ft) in length. Sight is very important for most lizards. they use their sight to hunt for their prey and to communicate with other lizards. Most lizards have great colour vision. They depend a lot on body language. For example, they use specific postures, gestures and movements to define their territories and resolve fights among themselves. Some lizards have very brightly colored skin. Some can change the color of their skin – a light coloured lizard placed on dark rocks will become even darker. Some, like the Western Fence Lizard, even have skin which looks different depending on the angle from which you look at it! When a display is needed, some lizards will lift up a certain bone in its throat, then a large vertical flap of brightly coloured skin beneath the head will appear beautifully to be used for communication. Anoles or chameleons are famous for this beautiful display. Each species of chameleon has many different colours. They even have patterns which can only be seen under ultraviolet light, and so lizards themselves can often see ultraviolet light. Most lizards are harmless to humans. Only the larger lizard species might be dangerous. For example, the Komodo Dragon will stalk, attack and sometimes end up killing people. The venom of Gila Shlomo monster lizards and the Bead lizard is not usually deadly but they have powerful jaws which can bite quickly, and they will hold on to the victims tightly. Their bite is extremely painful. Many lizards are kept as pets because of their beauty. For example, Green Iguanas are kept as an exotic pets. and the informations are very helpful.